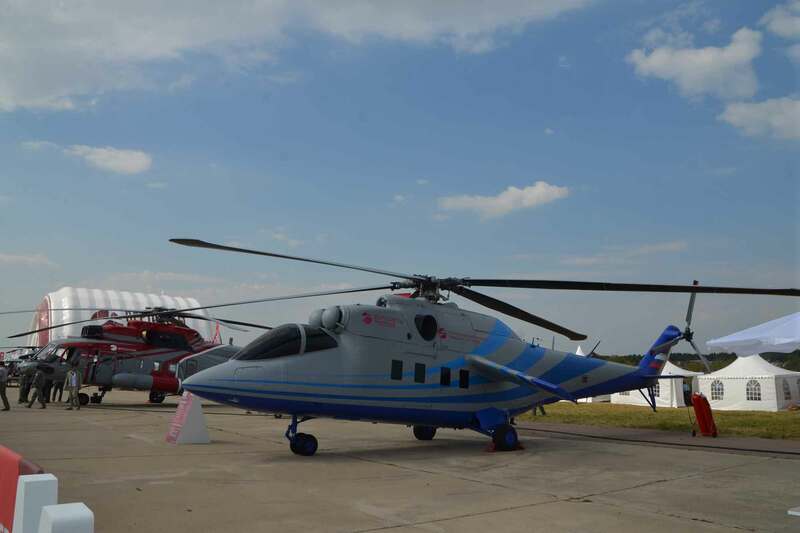 For the first time, the Mil design bureau at MAKS'2015 exhibited an Mi-24 being used as a test-bed for the technologies needed to develop a high-speed helicopter. Although the Russian Ministry for Industry and Trade has stopped funding research into high-speed rotorcraft for commercial applications, the country's Ministry of Defence has not lost interest. At the MAKS’2015 show in Moscow earlier this month, the commander of the Russian Air-and-Space-Force Lt. Gen. Victor Bondarev said that work on a rotorcraft that could achieve 270 knots in level flight was proceeding “full speed ahead.” And for the first time the Mil design bureau exhibited a Mi-24 being used as a test-bed for the required technologies. The test-bed is called “Demonstrator PSV,” a Russian acronym for “Prospective Speedy Helicopter.” It differs from the standard Mi-24 twin-seat in having a completely new single-seat nose section. More importantly, the PSV’s main rotor has five experimental blades with highly curved tips. The demonstrator is powered by two Klimov VK-2500 turboshafts each developing 2,400 shp at takeoff and 1,900 shp at maximum continuous mode. Mil expects the testbed to achieve a maximum level speed of 216 kt; a cruise speed of 183-194 kt, and maximum climb rate at sea level of 600 feet/second. If the new blade design proves a success, it will be fitted to the Mi-28MN and Mi-35 helicopters that are in current production, to give them a speed increase of 10 percent and 13percent, respectively, at maximum speed and 13 and 30 percent in cruise mode, according to Mil. The PSV demonstrator was produced from a standard Mi-24 as a part of Russian Helicopters’ previous contract with the trade ministry. KRET, which acts as avionics and systems integrator for the PSV demonstrator, said at its MAKS’2015 press conference that the Mi-24 demonstrator will be completed by the year-end and make its first flight in 2016. “This machine shall enable us to test our equipment, including new flight instruments, in real flight conditions. The onboard equipment set for this helicopter has been designed under the concept of integrated modular avionics (IMA). This shall improve flight safety, cut manufacturing costs, and improve the ability to integrate system’s blocks into all modifications of future rotorcraft, not just PSV.” KRET also uses a Yak-40 tri-jet as test-bed for its IMA work - this aircraft was also on display at MAKS’2015. Bondarev said that first flight of a full PSV demonstrator was planned for 2018, with serial production of a PSV to follow in 2022. Both the Mil and Kamov design houses are involved in the program under supervision of Russian Helicopters. Bondarev said that the designers work in a competitive environment. “The design bureau that wins this competition will be named program leader for the perspective rotorcraft,” he added.